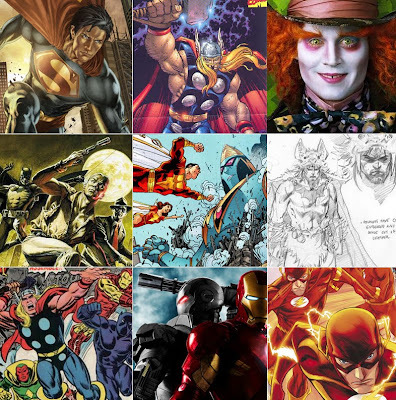 While Marvel and DC have kept many of their post 'event' releases to themselves for now, and the other publishers are yet to show their cards, here are the 9 things we already know of, that I'm looking forward to most in 2010. SUPERMAN: EARTH ONE It's hard to beat All Star Superman, but I'm pretty sure this original graphic novel series will be another bout of definitive Superman stories. THOR: The Thunder God's movie picks up some serious steam in 2010, and John Romita Jnr returns to drawing the comic. ALICE IN WONDERLAND: Johnny Depp, Tim Burton, imaginative Wonderland - 'Nuff said. FIRST WAVE #1: An alternate DCU where the icons of pulp fiction, like Doc. Savage and The Spirit breathe again. THE MULTIVERSITY: Grant Morrison's planned series of mini's, exploring the various worlds of the DCU - including Wildstorm? THE RETURN OF BRUCE WAYNE: Batman as a caveman. Batman as a pirate. Grant Morrison. Sells itself really. AVENGERS RE-ASSEMBLE: If Vision isn't part of the reformed heroic Avengers, I'll do the manly version of cry - hysterically. WAR MACHINE IN IRON MAN 2: That pretty much covers it. FLASH #1: A staple of my pull-list, Geoff John's return to an all new Flash book makes this #1 unmissable. Thanks for the post IronFist Fan - nice blog!